I have started planning some garden bed makeovers in my backyard which means coming up with some new garden color schemes. 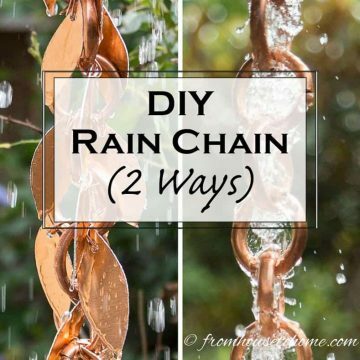 I have already looked at some blue and white garden design ideas as well as picked out some white flowering shrubs, but this process is a lifesaver for choosing the rest of my backyard color schemes. 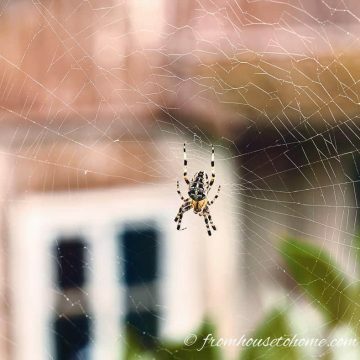 Now that the weather is getting nicer, I’ve been looking around my garden and realizing there are quite a few spots that need to be updated. I haven’t bought many new plants in the last few years, and some of the old ones are dying out. Which gives me the perfect opportunity to re-do some of those garden beds with some new backyard color schemes. Like the blue and white garden design ideas I shared a few weeks ago. It’s been a while since I’ve done a whole garden bed makeover so I needed to give myself a refresher course on how to pick a garden color scheme that will look good. I thought I would share my process in case anyone else is needing some garden color scheme inspiration, too. 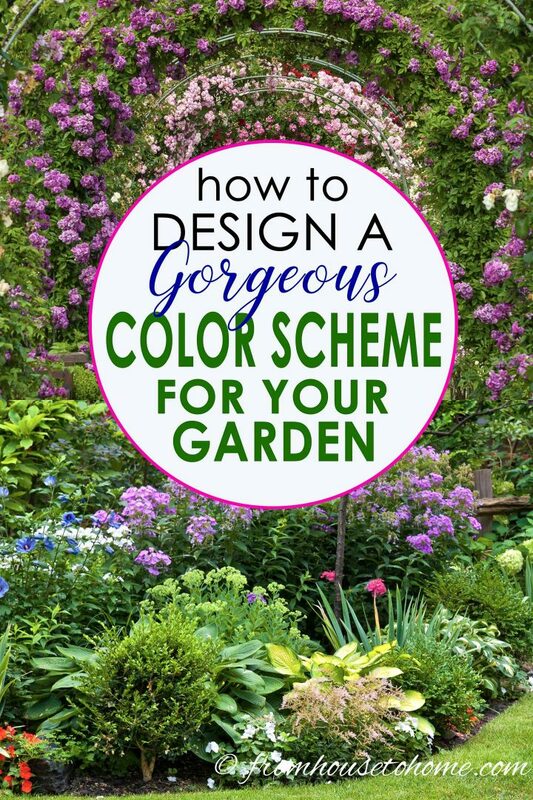 The first thing I do when I’m picking a garden color scheme is to decide on how I want that part of the garden to feel – soothing or energetic. 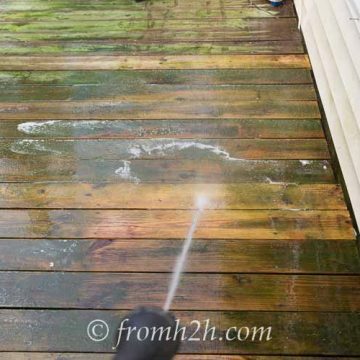 You can also choose to change the feeling of your garden depending on the time of the year. But in the summer, I like the soothing colors better. I think they give the illusion that it’s not as hot outside as it is. Once you’ve picked your feeling, it’s time to start on the colors. 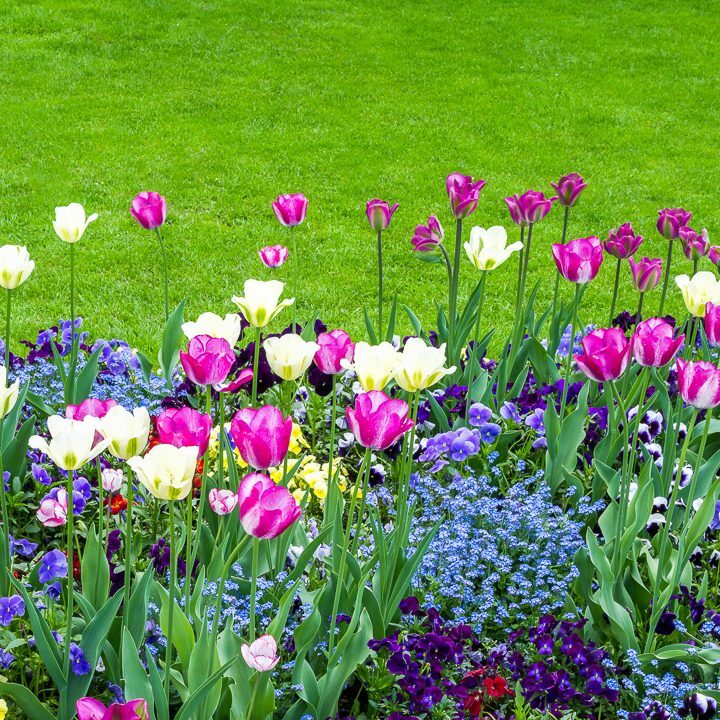 For a soothing garden, pick a main color from the cool colors (blue, purple and green). Cool color flowers add to the relaxing feel of a garden so this color will be your starting point. For an energizing garden, pick a main color from the warm colors (red, orange and yellow). Warm color flowers add excitement to the feel of a garden. 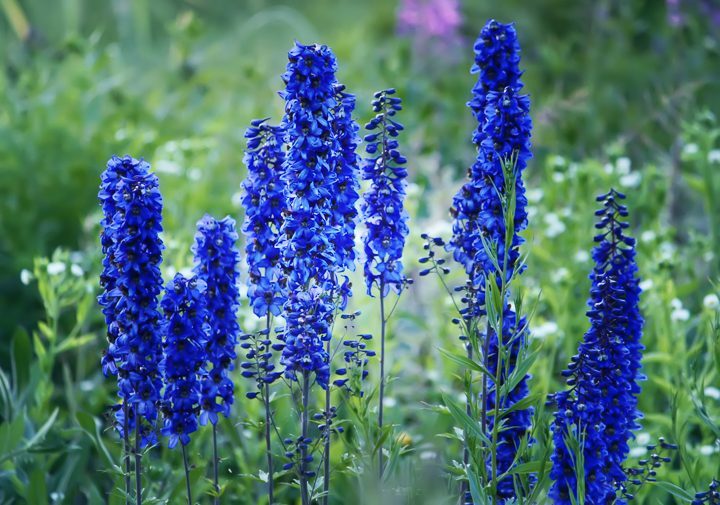 Don’t worry…this doesn’t have to be the only color in your garden (unless you want it to be)…just a starting point. Unless you want to plant an all-white garden, leave white out of your decision making process for now. Just like in decorating, white is a neutral that can be added to any color scheme, so we won’t be using it for choosing what colors to include. 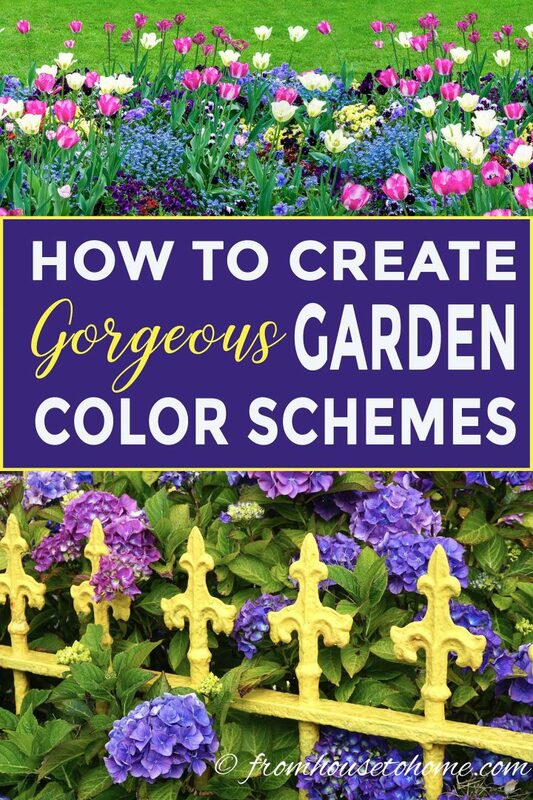 But I will give some examples of how to include it in your garden color scheme below. Okay, now it’s time to decide on an actual color scheme. 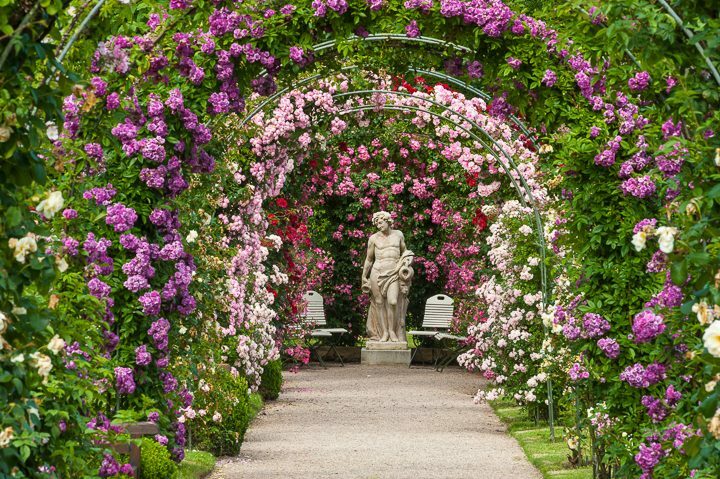 Once again, start with the feeling you want the garden to have. Then pick a “contrast level”. 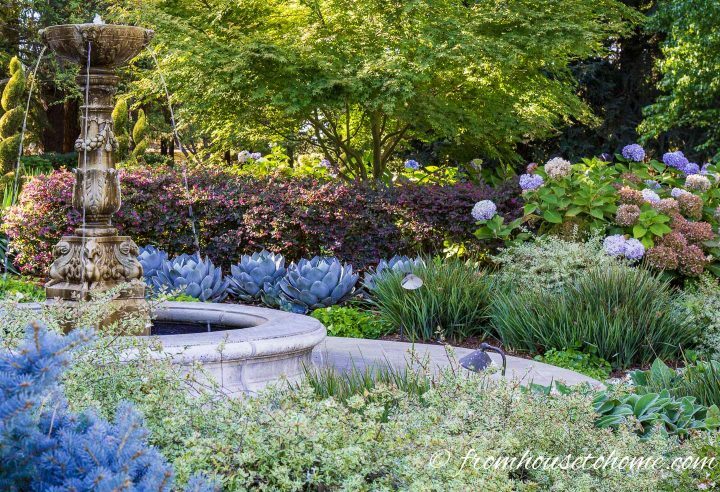 Most soothing gardens use low contrast color schemes. Energizing gardens often use high contrast color color schemes. Although a long line of red flowers is pretty energizing, even if they are planted in a low contrast color scheme. You may be saying…that’s great, but how do I know which color schemes are low vs high contrast? This is where you need to break out the color wheel. Yes, it is actually a useful tool for helping to pick colors even for floral design! Use your chosen main color as the starting point, and then pick one of these color schemes to determine what other colors to pair with it. Monochromatic garden color schemes are one of the easiest to create, and they don’t require a color wheel to get you started. Just take the main color you chose and run with it. 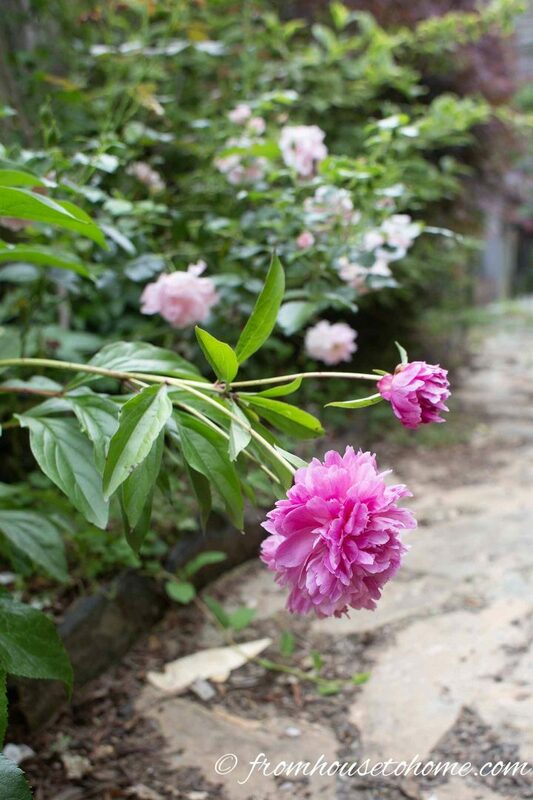 Pink peonies with lighter pink roses are an easy combination that I use in my backyard for a late spring monochromatic garden color scheme. Even though you will only be using one color for this floral design, don’t let it fool you into thinking it’s boring. There are actually many different ways you can implement it. You can go with flowers that are all in the same tone of that color. Like these red annual geraniums paired with red roses. Or use a variety of shades to add some additional interest. These roses in different shades of pink and red really draw your eye in. 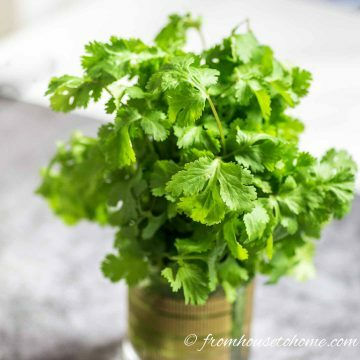 And don’t forget about plant leaves that can help to add to your monochromatic color theme. 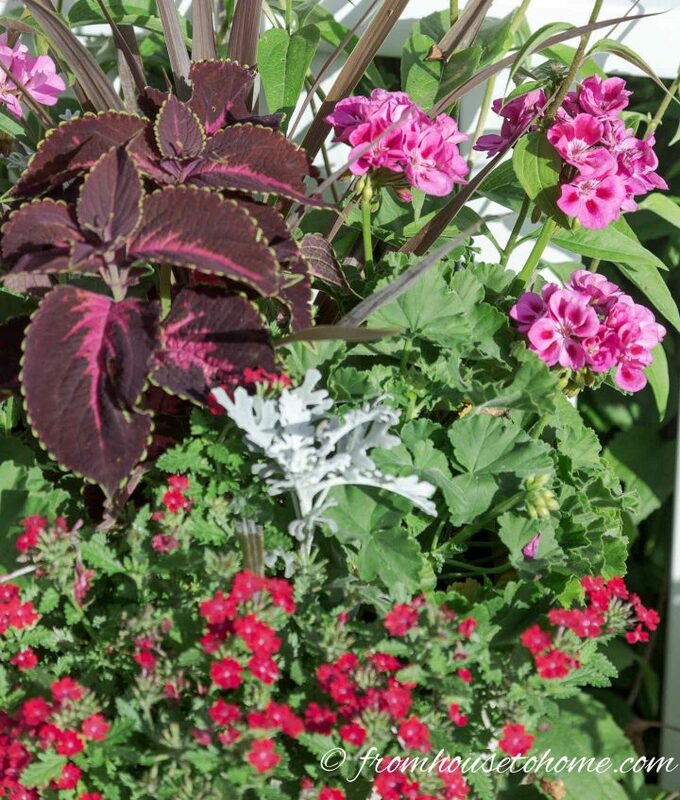 These red and burgundy Coleus leaves pair perfectly with pink annual geraniums and red verbena. If you’re afraid that the monochromatic look is a little too much of the same color, try adding some white into your garden bed for a little contrast. 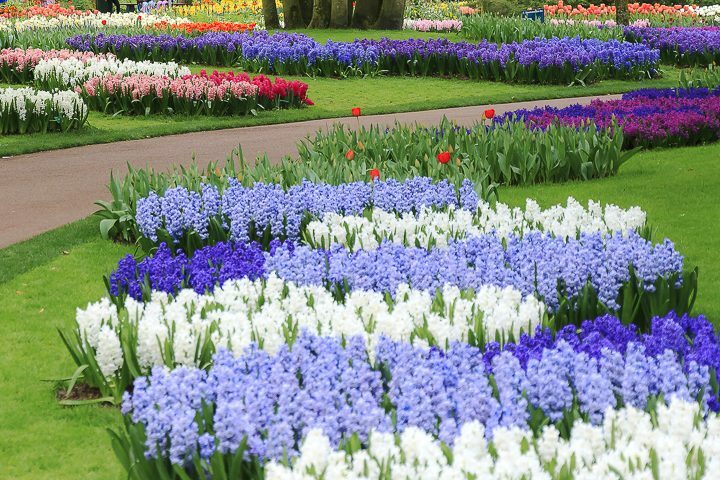 These Hyacinths in different shades of blue are broken up by swaths of white that help to make the blues stand out. 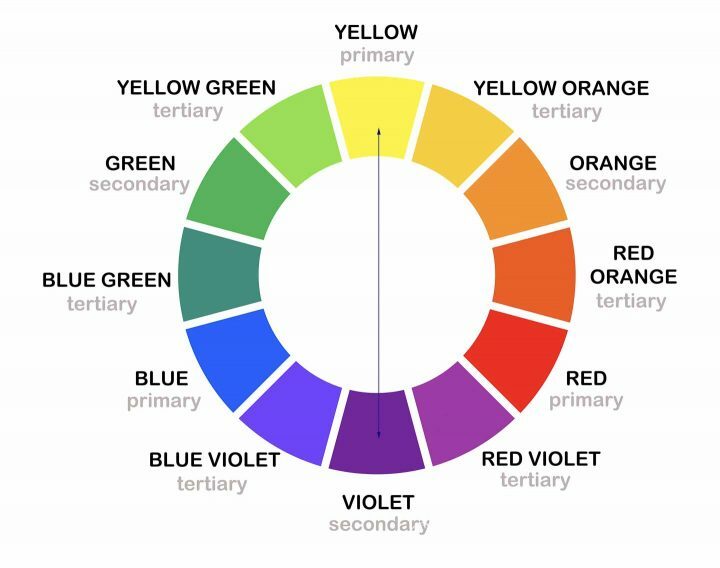 The analogous garden color scheme is created by choosing colors that are right beside each other on the color wheel. 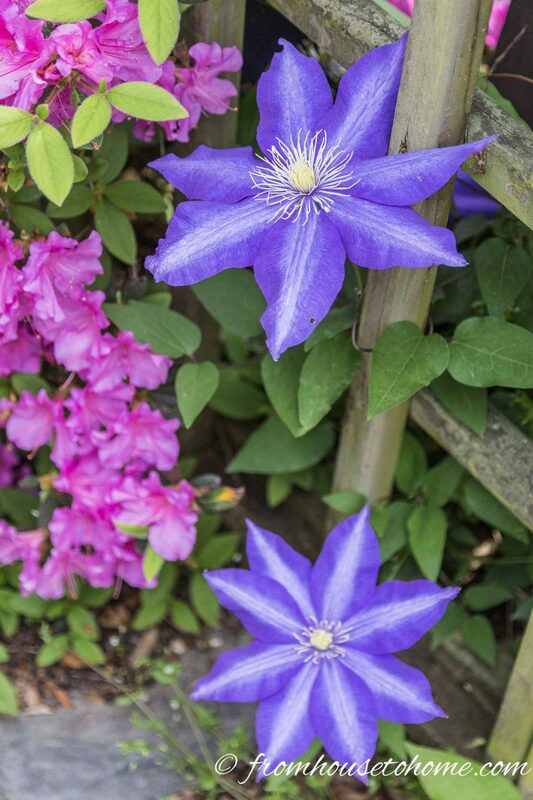 Even two side-by-side colors will work like these violet Clematis paired with pink Azalea flowers. 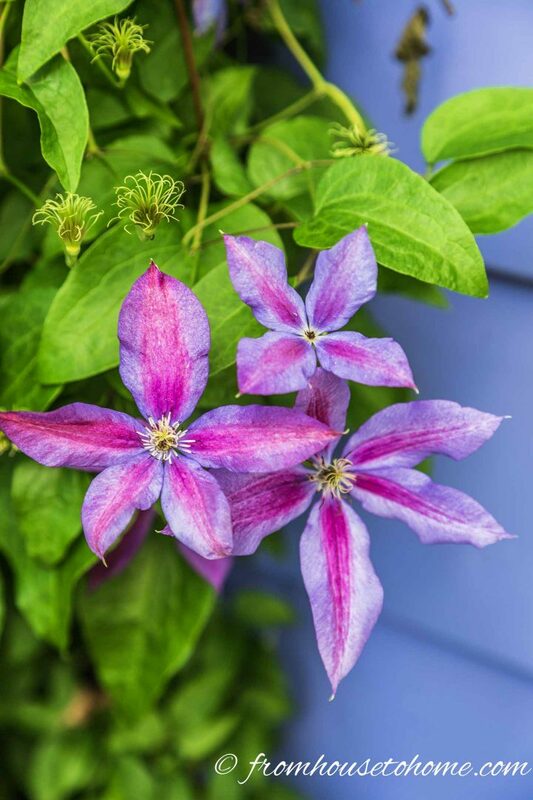 My mother achieved the same look by planting pink striped Clematis in front of her house, which happens to be painted purple. So you can use your garden structures as part of your garden color scheme, too. Using 3 or 4 side-by-side colors gives you more options to work with. This pretty garden border has fuchsia pink hydrangeas, light pink Astilbe, violet Phlox and blue Hibiscus that all work together to create a cohesive look. And once again, adding white into the mix helps all of the colors to stand out a bit more. Now we’re on to the high contrast garden color schemes that are really effective for creating interesting and energetic flower gardens. 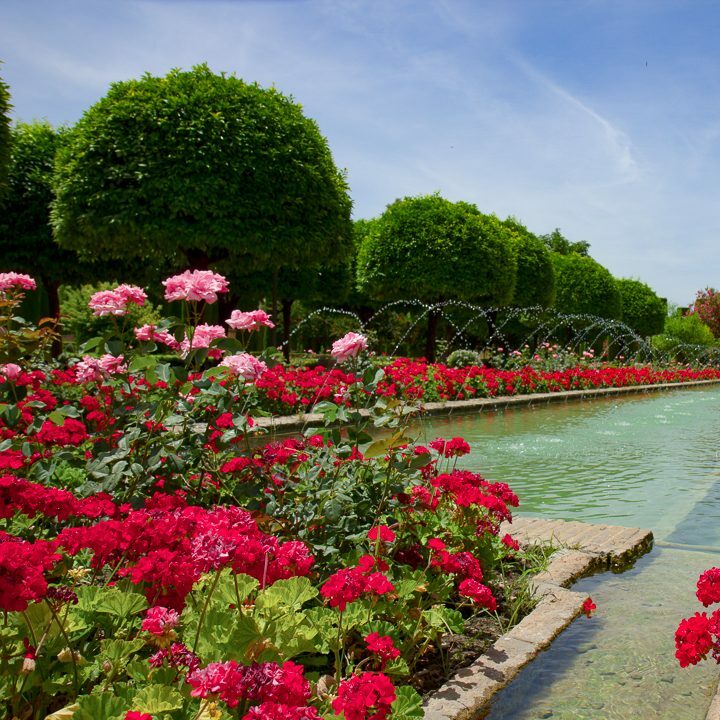 A complementary garden color scheme is created by selecting colors that are opposite to each other on the color wheel. Because of the color placement on the wheel, you’ll end up with a warm and a cool color in your garden bed which increases the color contrast and automatically adds some excitement to your yard. 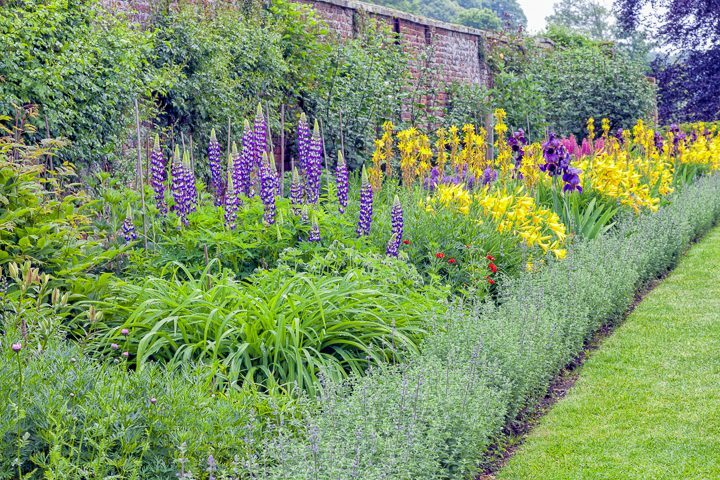 Pairing purple lupines and lavender with yellow day lilies makes both of the colors stand out in this garden border. 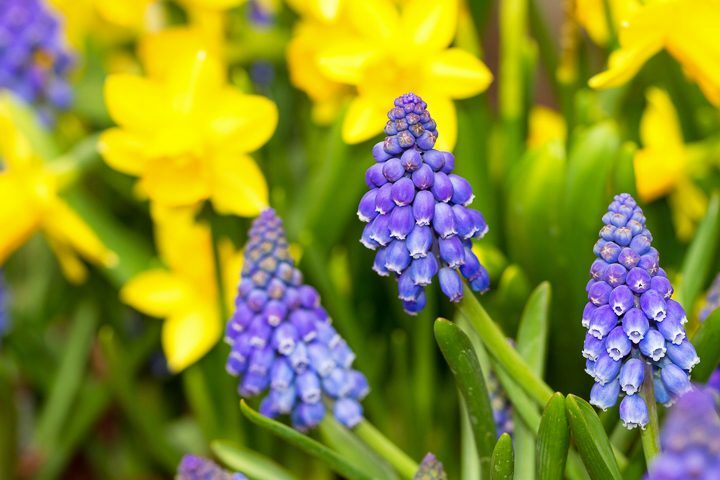 Grape Hyacinths with Daffodils is another common yellow and purple garden color scheme. Of course, you don’t have to stick just to flowers to create a garden color scheme. 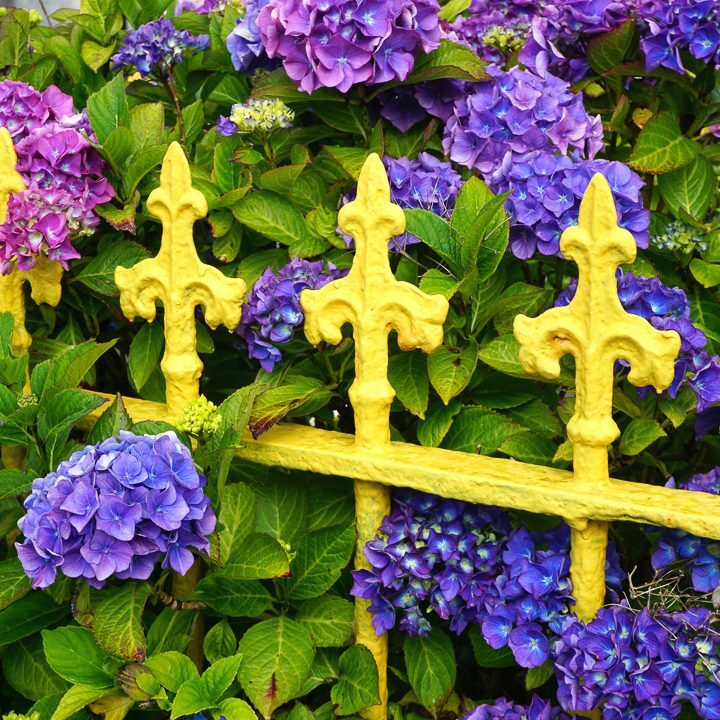 Planting purple hydrangeas around a yellow fence is a stunning look. 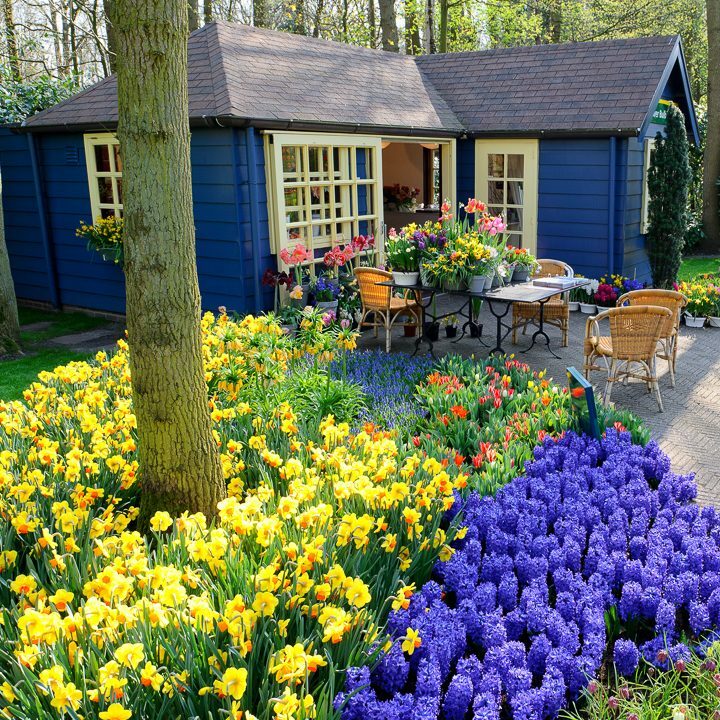 Or if you are really committed to your color choices, you could go all out and paint your shed (or your house) to match your floral design color scheme. If you want to do a complementary garden color scheme but would like to use more than two colors, the complementary color scheme may be what you are looking for. It’s basically a combination of the analogous and complementary color schemes. To do this, pick two closely spaced colors on one side of the color wheel, and one color from the opposite side of the color wheel. In this case, you will end up with two warm colors and one cool color, or two cool colors and one warm one depending on which colors you choose. So you will probably want to use your main color as one of the analogous (side by side) colors. 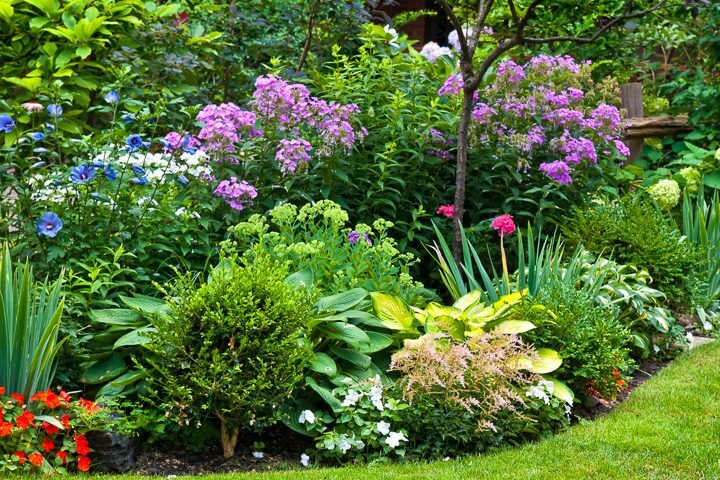 Otherwise, your garden bed may not end up feeling the way you want it to. For even more contrast, the triadic garden color scheme involves picking 3 colors from the color wheel that form triangles between them. This is the most complex of the color schemes which can make it a little trickier to pull off but can also create some really interesting color combinations. Don’t forget you can also use structures to accomplish your goal. 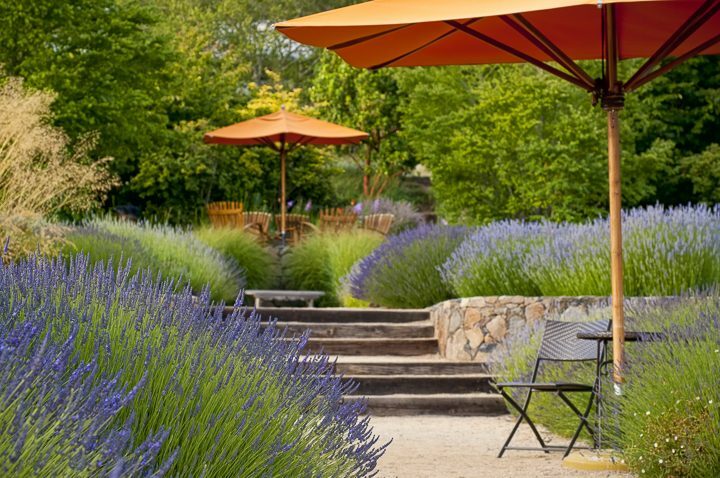 This triadic garden color scheme uses purple lavender, orange umbrellas and the green of the evergreens to accomplish its look. Check the bloom times of the plants. If the blue ones bloom in the spring and the white ones bloom in the fall, you’re not going to get the beautiful blue and white garden you were looking for. 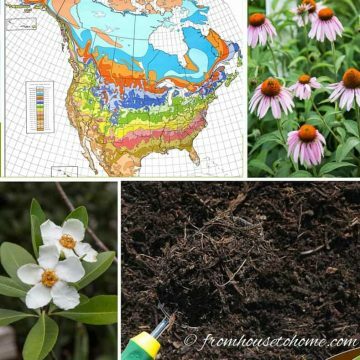 If you want your garden feeling to change for the seasons, plan your border so that plants with different bloom times and flower colors are intermingled in your garden bed. Don’t forget that plant leaves and landscaping structures can also add to your garden color scheme. 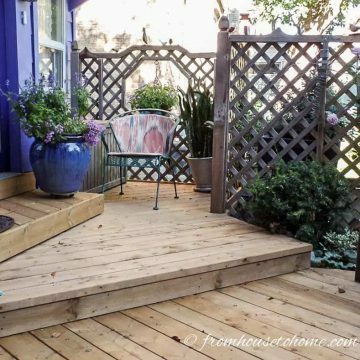 This garden is using blue evergreens, and succulents to continue the blue garden color scheme that started with the hydrangeas. Buy at least 3 of each plant. One thing you’ll notice about all of these pictures is they don’t just have one of each plant. Using groups of the same plant and then repeating the color throughout the garden is the best way to create a cohesive look that makes a statement. 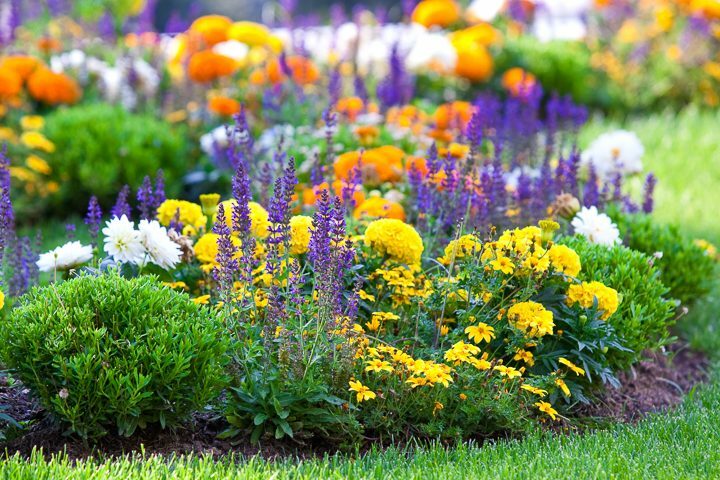 Fill in with annuals if you can’t find the right color flowers for your perennial garden scheme. Have comments or questions on our tips for creating beautiful garden color schemes? Tell us in the section below. 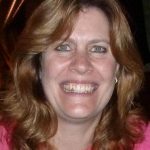 I just talked to a landscaper who can help me get some of the ideas you just gave. I should have looked at your email first but the guy was nice and told me to look around and keep what I like. So you are going in my folder.